WSU Alert is a system for quickly delivering emergency phone, text and email messages for students, faculty and staff on the WSU campus. WSU Alert will notify you when there is a campus emergency or there are circumstances that may affect campus closings, such as weather events. Why would I be hearing the sirens or getting an alert? You may be hearing the sirens or receiving an alert if there is an emergency situation, such as active shooter on campus or gas leak. You may also receive an alert if there is a change in WSU schedules, resulted from circumstances such as weather events. What do the sirens mean? The sirens indicate a test of the WSU Alert notification system, or an emergency on campus. What should I do when I hear the sirens? You should be receiving an alert with more information on your cellphone shortly. Pay attention and be alert to your surroundings. Make sure that others are aware of the potential danger. Do not rely completely on WSU Alert- these notifications are intended to support decisions for personal safety. Why can’t I hear the sirens when I am inside a building? WSU has installed five outdoor warning siren/public address units on the Pullman campus. The University may sound these sirens in the event of an emergency that may threat the safety of those outdoors. The sirens are designed to be heard OUTDOORS ONLY. The siren tones are prone to echoing among the buildings on campus; however all possible adjustments have been made to improve the intelligibility of the voice messages. Even if you cannot understand the voice instructions, your default action should be to always take shelter and seek further information from other WSU Alert resources. Why is WSU doing a door locking test? It is important that our campus community is aware of WSU Alert and our abilities to lock down campus in case of an emergency. Having this kind of test allows our community to learn and practice emergency procedures. What am I supposed to do when the test starts? During the test, please consider the actions you might take in a real emergency. Use this short amount of time to consider what sorts of actions you might take in a real emergency. Look for areas in which you might shelter in place and locate the exits around you. Departments and classes may use this time to discuss emergency procedures. During a real event, WSU will activate appropriate components of the system to alert people that they should be Aware of the situation, Assess their individual circumstances, and Act to take appropriate safety precautions. WSU encourages students, faculty and staff to be personally aware of developing incidents, assessing each emergency individually, and taking actions to ensure the safety of all. I saw that desktop alerts are going to be added to this test. What should I expect to see? Desktop alerts are the newest addition to our WSU alert system. Those who are logged into the WSU system on select desktop computers across campus can expect to receive a desktop pop-up notification. The notification will be a full screen pop-up alert. Once you have read the notification, the only action you should take during this test is to click the “acknowledge” button and the pop-up will disappear from your screen. During a real emergency, please follow the instructions described in the message. See the image below to familiarize yourself with what the desktop alert will look like. How will I know when the door locking test is over? An all clear message will be sent out via WSU Alert at 12:00 p.m. The doors will automatically unlock at this time and schedules will resume as normal. If you have manually locked a door to participate in the test, please unlock it. 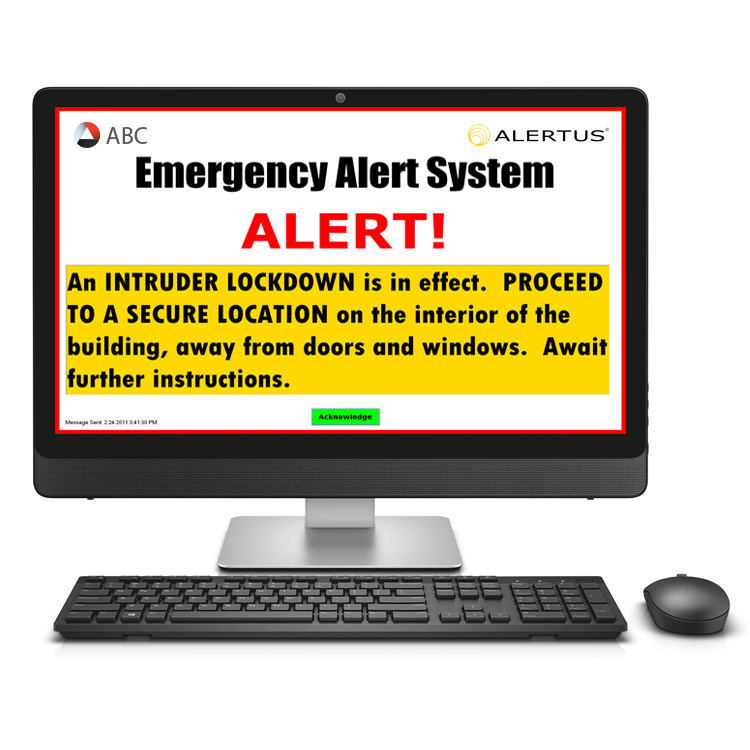 A lockdown is the confinement of people inside secured rooms for safety measures. 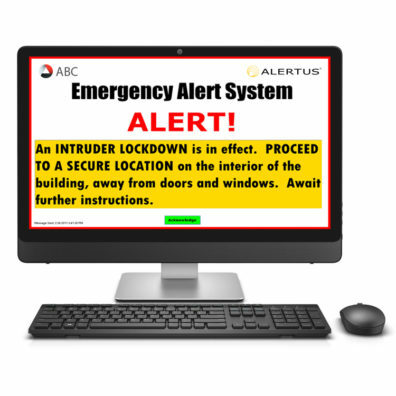 It is used when there is a serious threat to the campus that requires students, visitors and personnel to remain in a locked building/room for safety. What should I do during a lockdown? WSU Pullman is not exercising a lockdown drill during this test. However, we encourage you to think about what actions you might take during a real emergency. I received more than one notification when you do the semester test. Why is this? I don’t want to get the same alert a bunch of times. There are many ways to sign up to receive alerts, and WSU Emergency Management tests all avenues to ensure that they are all properly working. How fast will I get a notification? The speed of messages vary with the time of the day, network connections, and sizes of the audience. Our system usually reaches approximately 25,000 contacts in under five minutes. Where can I sign up for the notifications? WSU students, staff and faculty can sign up for WSU Alert notifications through myWSU. Can parents sign up to receive emergency messages? Our first concern in an emergency is to get the word out as quickly as possible to students, faculty and staff on campus. When more people are added to the notification list, it takes longer for everyone to receive the message, risking the safety of those on campus who may be in danger. Students may put their parent’s phone number as an alternate contact when they sign up to receive alerts, but WSU encourages parents to watch the university homepage, alert.wsu.edu or follow @WSUAlertPullman on twitter for information during an emergency.